In Ep. 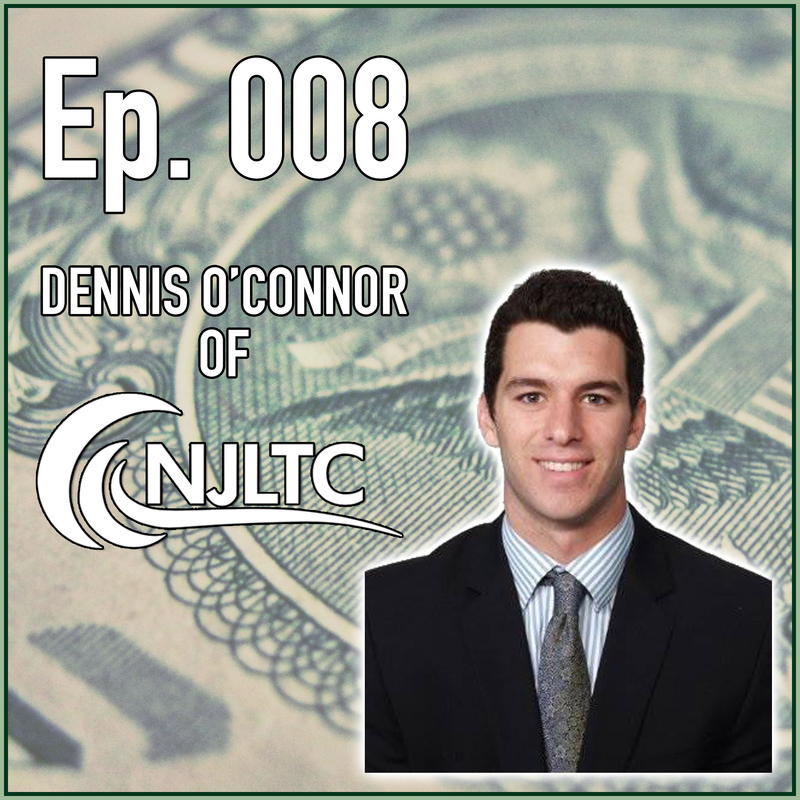 008 of Living With Money, I talk with Dennis O’Connor from NJLTC. NJLTC focuses primarily on setting their clients up with disability insurance and long term care. I talk with Dennis about his beginnings in the industry, working with his father, as well as outlining the need for disability insurance and the intricate ins and outs of long term care. If you’ve been considering whether or not to get yourself some “paycheck protection”, as Dennis calls it, or disability insurance, you’ll definitely enjoy today’s episode. Here’s episode eight of Living With Money, my conversation with Dennis O’Connor. Tim Mullooly: Welcome back to Living With Money. This is Tim Mullooly. On today’s episode I am joined by Dennis O’Connor from NJLTC. Dennis, thanks for coming on the podcast. Dennis O’Connor: Thanks for having me. Tim Mullooly: Let’s just dive into a little background on you. Tell us how you got started working for NJLTC, and also kind of a little background on your journey in life up until that point. Dennis O’Connor: My Dad started the company in 2000, I want to say 2001. I was in high school. He had been working at Unum on the carrier side, and decided he wanted to start his own thing. I kind of grew up in it, my whole life. In the summers, before I started having real jobs, which at that time were sporting goods stores, actually the whole way through. I used to go help him out, run copies, help him run quotes, things like that. I like to say now, that I’ve always been unintentionally groomed for it my whole life. Ended up, I grew up around this area, Monmouth County. I ended up going to school in the city. As I was finishing college, I had no idea what I was going to do. At the time, my plan was I was going to be a sales rep for the clothing company, I had interned and was sponsored by for surfing. The idea was, okay, this summer I’m going to intern for them. I’m going to lifeguard, because my other motive was to lifeguard down in LBI and bartend. Just spend the entire sunny summer, save up a ton of money and then go do something. Coming out, my Dad was, hey listen. You’re my son. I know you. You enjoy stuff. You’re going to want a real job. Basically 10 days before I graduated, he called me up and he was like, hey, I was talking to one of my buddies that was formerly at Unum. They have a company called Cigna. They had basically a mass hiring for new reps across the country and there were two slots left open. One was Denver and one was Southern California. For me, I was like, sweet. Either one of those is fantastic. I snowboard. I surf. They’re both cool cities. Great. I ended up getting a job out with Cigna doing group benefits, so group life disability for companies 50 to 5,000 employees. Was in San Diego for four years, which was fantastic. My now wife, at the time girlfriend, we had met in college, she came out. We were both out there together. She got transferred back to the city. We were both the only people out there in our families. It was naturally, I was going to plan to come back. I tried at first to stay with the company I was at, while I was out there. There wasn’t really an opening here. It just didn’t really line up, so I talked to my Dad about coming back and doing kind of what he had been doing. The answer was like, great. Let’s try it out. Here’s what I do. Good luck. Go knock on some doors. That’s kind of what led me to where I am now. Tim Mullooly: Awesome. I didn’t know you lived in California for a couple of years. Compared to New Jersey, what are the differences? Which one did you like better? Dennis O’Connor: It’s very hard to describe to someone who hasn’t been from here, lived out there and then come back. If you talk to someone who’s been out there, they’re kind of on the same page. First and foremost, the dumbest sounding statement I can give, is that 70 and sunny every day, eventually gets boring. Again, sounds really silly. Tim Mullooly: Sounds hard to imagine, because I’ve been in New Jersey my whole life. Dennis O’Connor: Exactly. The first year and a half, it’s amazing. During the first year I was out there was 2010, and September is when I went out. January 2011 here, for whatever reason, every Friday there was two feet of snow. Every single week for the month of January. Out there, the entire month of January, calendar month, it never got below 73. It was absurdly nice. I was out there like, you guys are idiots there back on the East Coast. Tim Mullooly: Yeah, for real. Dennis O’Connor: It gets to the point where I was there for four years, and I honestly think it rained 12 times. Dennis O’Connor: Which is, again, sounds great, but here when you step back and you go do something else and you come back, the cliché thing is, I like the seasons, I like the seasons. It’s not so much that the seasons themselves are cool, which I actually think they are, but it’s more so that each season brings its own unique piece, and you start to appreciate each piece more when you don’t have it all the time. Here, it’s winter, like when it first starts to get cold out, you’re like, oh, this is great. The first snow you’re like, oh, it’s so pretty. Then, the second day of snow you’re like, go away. Dennis O’Connor: But, as it starts to get warm out, it starts to get nicer, and the days start to get longer, you’re excited about it and there’s this feeling of, okay, I only have four months of nice before it starts to get cool and dark again. I have to make the most of this. You appreciate it more. You start to get jaded and take it for granted when it’s 70 and sunny every day. Then, as a surfer, there was a very high quantity of waves. People have a hard time believing this, but the waves here in New Jersey are actually, I think, on a good day, better than there. There’s also significantly less amount of people. That aspect also brought me back. I missed surfing in the wintertime here, because it’s an experience. Tim Mullooly: That’s an interesting perspective. I never really thought about it that way, in terms of when it starts getting warm here again, you start getting excited, looking forward to the springtime, but if it’s always 70 and sunny, then you don’t really get to look forward to the weather changing at all. Dennis O’Connor: I’ve had a long time to think about that, because I get asked so often, that I needed a way to articulate it. You know what, I had to really sit down and think about it. This is what it is that drives that. Tim Mullooly: As you know here, Mullooly Asset is a family business. I work alongside my two brothers and my Dad. What’s it like working with your Dad? What are some of the benefits that you see, and also if there’s any sort of challenges? People always ask us here, do you guys get along all the time? It’s like, no, absolutely not. That’s just normal. What are some of the ups and downs of working with your father? Dennis O’Connor: I have to be honest, it’s actually been really good. We’re to the point now where it’s been four years. Like you said, there’s occasional things that happen, like you get in an argument or something like that, and even more so because my father and I are extremely similar. I think a lot of times in a good way, but there are definitely times where maybe it’s not the best thing. But, it all depends on doing it and having it go well. I could also see how it could go very poorly. In my case, it’s not just that I work with my Dad. It’s also family, but he’s had the same employees for as long as I can remember. Tim Mullooly: Close knit group. Dennis O’Connor: Yeah. You can bust someone’s chops and joke around. There’s like a certain looseness, where you can be much more direct then if you have to be conscious of what you’re saying, because you don’t know how someone’s going to take something. There’s a very similar personality type, because you know what you’re dealing with. We do a good job, I think, of shutting off when we leave. I know you and I talked about this when we met previous to this, where that’s one part where if you work with someone all the time, and then you’re with them all the time, you’re still talking about work. There needs to be that separation or else it gets so monotonous. You’re consumed by it. I think that helps. Then, I think, and my Dad was really big on this, was go work somewhere else first so that you see what it’s like just in the real world, and having a boss that isn’t your father. I think it had always been the idea and thought that we’d end up working together as long as I liked doing what I do, which luckily I happen to. But, having real life experience with a real boss, in an office where politics and all that stuff you have to deal with, it just helps you keep things in perspective. Tim Mullooly: Right. Kind of separates the work and personal side of things. Sometimes, you have to get stuff done at work, and you can’t take things personally, so I definitely agree with what your father said. Getting some real world perspective and not taking it too personally when things need to get done at the office. Dennis O’Connor: For me personally too, I think one of the other things I think really works so well about us working together is my Dad knows how to motivate me that right way. He knows what buttons to press. He knows how to not let me rest on success, but also separates himself and be like, as a Dad, I’m proud of you. As a boss, I want more out of you. That type of thing where, at my first job, I definitely, especially in the group insurance spaces, a lot of freedom. I went into an office where there was two reps in the office that were absolutely blowing their goals out. The manager didn’t have to worry as much about me, because overall we were way ahead of where we needed to be. It was basically a ship that ran itself. There was a lot of freedom, that I absolutely took advantage of. Coming back, there’s a lot more of being held responsible, where it’s never to the point where I’m like, all right, enough. But it’s also enough that it keeps me on task and successful and things like that. Tim Mullooly: Right. At NJLTC, you guys focus primarily on disability insurance and long term care. We’re going to take those two and separate them a little bit and talk about each individually, and kind of break it down. When you start working with a client, how do you determine if they need, or how much of a need there is for disability insurance, and at what stage in a person’s life should someone really be looking to get some disability insurance? Dennis O’Connor: I always argue that DI is one of those things … DI, disability insurance. One of those things where it’s kind of like a slap you on the head kind of thing. If you don’t have it, why? What are you doing type thing. Now, there’s always analysis of each individual’s person’s situation. In my particular case, is a great example. I have it on myself. Obviously I do what I believe in it. I work, but so does my wife. My wife has it through work, so she didn’t really need individual disability. She has it through work. There may be a point where if she wants to look against that, but were both young. I’m 29, she’s also 29. It’s enough that it’s comfortable, but if something happens to me, I’m not the sole breadwinner. Our ship would continue to sail. It would probably be a little harder, but it would continue to sail. In my case, my policy doesn’t cover the maximum amount that I need it to. It covers enough to basically cover the mortgage and cover the bills so that if something happens to me where I can’t earn an income, for whatever reason, we get to keep living as comfortably as we possibly can to how we do now, where it’s not like we’re struggling. She’s got to pick up something else. Tim Mullooly: Completely change your lifestyle. Dennis O’Connor: Yeah. It helps me sort of artificially carry my weight through the insurance itself. To me that’s always a big thing. What is the situation? If you’re a sole income earner, if you’re the sole breadwinner of the household, then it’s no longer an if, it’s an absolute necessity, because if something happens to you, especially if you have other people depending on you, it’s imperative. Tim Mullooly: You need to have income coming in, or supplementing that. Tim Mullooly: They might not be able to find a job that will bring in the same amount of income too. Dennis O’Connor: Oh yeah. Without a doubt. Tim Mullooly: There still would be a gap even if the spouse starts working. Is there a certain age at some point in someone’s life, or like a life moment that you kind of nudge people in the right direction and say, you should start thinking about this? Dennis O’Connor: Realistically, it’s one of those things that the earlier, the better, because when they underwrite you and price you, it’s all based on a bunch of factors, your job, but very specifically your age as well. With a lot of these companies, what they have is a thing called future insurance. What it is is, you buy it at 25, your first job, minimal benefits, $2,500 a month, you only make $30,000 to $50,000 in your first role. You get it, but you’re also locking in your insurability. As you progress through life, progress through your professional career, and you’re doing well, you can increase the amount of money in your benefit to match the money that you’re making without having to re satisfy your medical underwriting piece, which we’ll get into in a little bit, just talking about that. But, it’s a huge advantage because life happens. Tim Mullooly: You have other people depending on you, or things to cover. Dennis O’Connor: Exactly. Serious financial requirements up ahead of you. Tim Mullooly: You touched a little bit on, or mentioned the medical underwriting process. What goes on during that process that people should keep in mind in terms of how much coverage, or what is included in the coverage? Dennis O’Connor: Basically, the way they’re going to determine everything and this is, you pick the plan you want based on what you feel you need. There can be limitations depending on what you do. If you have a more risky job, maybe some of the options aren’t available to you. For the most part, you get to pick the plan you want in terms of contractual wording. You’re going to pay for it, but you get to pick what you want. Your benefit amount is based off of how much money you make. It’s money you are paying taxes on. We get people all the time who are sole business owners. They say, I make $300,000, but I write everything off, and I only show 10 on my taxes. Well, that’s how much money you make at the end of the day, because it’s the only thing they can go off of basically. One of the biggest things we get when someone comes in to look for insurance, or one of the biggest issues that we run into is, people that have some sort of issue already, and want to get coverage because they either plan on going out, which is the most extreme version of that. Or, they know something is wrong with them. They’re fine now, but they want to make sure in the future it doesn’t come back to bite them. There’s thousands of ways for you to be prevented from making an income. It’s not just, oh, you say disability insurance, for some reason everyone always goes to total catastrophic disability, like car accident, you’re paralyzed. That’s it. There’s really 90% of the claims are actually illness related. Something that keeps you out of work, cancer, things like that. But, there’s a thousand different ways that you can get disabled, so they can’t just say no, because you have something wrong with you. But what they do is, if there’s something wrong with you, they’ll exclude that from coverage. The most common example is back problems. If you have an issue with your lower back, let’s say you were in an accident. You slipped a disc. You’re going to be okay, but it’s relatively recent. What they’re going to say to you is, okay. We’ll give you coverage, except if you’re lower back is the reason for the problem. Now, depending on the severity of what you have wrong with you, they could exclude it forever, but a lot of the times what they’re going to do is say, this injury just happened. It’s way too fresh for us to feel comfortable saying, sure, we’ll give you coverage, but if you go a year or two, or three without any issues, then you’re probably not going to have any issues with it. You’re not going to commit insurance fraud. You’re not going to have that kind of patience to wait three years and be like, oh, finally I can go on my claim now. They’ll reconsider those down the line, but that’s where a lot of people get held up, is they’re so shocked that they won’t cover them because they have a hurt back, or they’re about to go out and they want to get paid while they’re out. Dennis O’Connor: Without a doubt. Tim Mullooly: Any problem? To make sure everything possible is included? Dennis O’Connor: There’s a roofing company around here that has a thing, it’s like a billboard that displays, and it’s by my house. It like, the best time to fix your roof is when the sun is shining. It’s that kind of situation. Tim Mullooly: Right. You think about other types of insurance, it makes sense. Same thing with a car, you can’t buy car insurance after you get in a car accident. Tim Mullooly: Or, you could, but it’s useless. Dennis O’Connor: It’s not going to cover you. Tim Mullooly: Yeah, exactly. That’s interesting though. That’s something I feel that a lot of people probably don’t think about, or they don’t realize. It might be kind of frustrating to them when they come in and they hear that. Dennis O’Connor: Absolutely. Generally, when you explain it to them, they do understand a little bit better. Like, hey listen, you got a policy that’s going to pay you when you can’t work. You’re telling me you can’t work. Why would they want that? A lot of times they’ll be like, oh yeah, I guess. Tim Mullooly: They’re not happy about it. They’re like, yeah, that makes sense, but I’m not happy about it. Okay, that’s a little bit about disability insurance. Is there any other tips or things that you’d tell someone looking to get disability insurance? Dennis O’Connor: Just, it’s not a bad idea to ask somebody in the profession to take a look at what you have. Ideally you find someone who’ll be honest with you, but a lot of people, especially people who have benefits through work, think they have a certain amount, and it’s significantly less than they actually do. It’s not a bad idea, whether it’s your HR person, whether it’s an insurance professional, whoever it is, ask, and get a clear answer. Just so that you’re aware of, hey, worst case scenario, this is what I’m in for. Tim Mullooly: I feel like disability insurance fits, especially for younger people, fits nicely within the realm of a financial plan. Tim Mullooly: Kind of like what we do here. It’s just another piece that you want to build on. We talk about budgets and cash flow and some sort of estate planning, like wills and stuff like that. Disability insurance is one thing that you should work into a larger financial plan. Dennis O’Connor: Absolutely. We talk about it all the time with clients because you get clients that’ll go, well, I don’t need it. You’re like, we use the same example all the time, and it’s a really silly one, but it kind of opens people’s eyes, and it’s nature. People hear disability insurance, and they get turned off. It’s just paycheck protection. We tell people all the time, if you had a ATM machine in your basement that was literally just printing money. If it stops working you don’t get any more money, but you could insure it so that if it stops printing, they’ll just give you a new one. You’d be like, okay, yeah. Well, that’s exactly what you’re doing. Tim Mullooly: That’s your paycheck. Dennis O’Connor: Yeah. You are the ATM machine. Dennis O’Connor: Make sure that if you can’t work anymore, you still keep earning money. Tim Mullooly: Like you said, back in the beginning, it’s kind of like a slap on the head, because it’s something that people might be turned off to or think that they don’t need, but once you open their eyes to it, oh, well duh. Something that I should definitely think about. Tim Mullooly: Moving from disability insurance to LTC or long term care, is the process kind of similar to disability insurance when determining say, if long term care is necessary? Dennis O’Connor: Somewhat, but it’s to me, if it’s … This is absolutely only my opinion, if you’re doing it right, it’s way more involved. DI, like I said, very cut and dry, very slap on the head. Long term care, just as a marketplace and as a product in general, has been changing rapidly because there’s so much of a need for it. It’s happening so often that the carriers who originally created the products basically guessed wrong when they first made them. Now, they’re paying out so much money in benefits, because so many people need it, that prices have gone up, benefits have been reduced, things like that. Whereas with DI, it’s like hey, if you don’t have this, you’re just completely making a mistake, and get on this. With long term care, there’s so much more to wrap your head around, where it becomes a conversation first of, do you understand this, and understand the need for this? Realistically what that comes down to is, have you experienced this yourself with either a family member, a neighbor, whatever it is, and seen firsthand what this looks like when it’s happening, how expensive it is, and how quickly it can just deplete everything? If that’s the case and you understand the necessity, then it’s just solely and totally a question of, what’s your situation look like? Where are your finances? What’s your plan going to be in terms of where you retire to, things like that? Do you have a spouse? Do you feel comfortable self-insuring part of it? There’s a lot more that goes into it, which makes it fun on my end because it kind of separates you from the cut and dry insurance world. You get to really dig in and help somebody, but there’s a lot more involved in it. Tim Mullooly: For someone who’s listening and isn’t terribly familiar with long term care and what’s involved with that, could you kind of breakdown an example situation of someone who might need long term care? Dennis O’Connor: At its root, long term care covers medical costs associated with either the loss of your mobility, which in this case they use things called activities of daily living. You have to have two of six that you can’t do, or some sort of cognitive impairment, which would be like Alzheimer’s, dementia, things like that. Then, it’s all the care that goes into someone when they hit that point. You talk about someone going into an assisted living facility, having a home nurse come in and take care of them at home, someone around the house to take care of grandma, or mom. That’s most commonly the thing, but it’s extraordinarily expensive. It adds up really quick. This whole product has been designed around trying to protect against that. Tim Mullooly: Going from disability insurance to long term care, it seems like these obviously happen at different phases in people’s lives. Is there kind of similar to disability, where you need it beforehand? Is that the same case with long term care, or is that something you can get after the fact, like if someone develops Alzheimer’s or dementia? Dennis O’Connor: In very rare instances you can, but once it’s already happened you’re not getting a whole lot, because basically you’re already on claim. You’re basically just going to maybe get a little bit more of the money you put in to fund yourself. There’s an overlap in terms of the eligible client, basically. Your average working person, for the sake of easy numbers, works to age 65. From 25 to 65, you’re really looking at DI the whole time. Once you start hitting 55 and up, maybe DI is not as important depending on how much you’re working, whether you’re kind of fading out, or you’re still churning and burning. LTC starts to come into play at around age 40, 45. That’d be like the earliest. You’re looking at it from a pure LTC perspective. There’s now life insurance with long term care rider, where if you’re younger and you’re buying life insurance anyway, it’s really not a bad idea to throw that on there, because it’s not very expensive, especially if you’re young. And, why not two birds with one stone, so you have at least something in place, so that as you get older and potentially need more, than you have a base there. But, yeah, there’s kind of a transition where there’s going to be an overlap where you’re looking at both and paying for both. But, as one is starting to fade, that’s where the other one kind of comes in. Tim Mullooly: That was going to be my next question. I was going to say, with your clients at NJLTC, is there a lot of times a natural transition of getting these people their disability insurance to working them into thinking about long term care? Dennis O’Connor: Really the only time we see that consideration is when you have someone whose like 60, and still working, no disability. Now, realizes that they’re probably a little bit more prone to things potentially stopping them from working at their age. Then it becomes a decision between, do I get DI or long term care now? Well, can I get long term care, and it’ll work like DI? But, outside of that, not really, just because you had DI for so long. If you’re doing it … I don’t want to say right, but if you’re proactive about it, there’s definitely a period where you’re kind of not necessarily transitioning out of it, you’re just doing both at the same time, and then you kind of fade out of one as you age into your late 60’s, and stop working, things like that. Tim Mullooly: So apart from obviously these types of insurance are there to help with the income coming in, what are some of the other just main benefits of having disability insurance and or long term care? Dennis O’Connor: At the root it’s, DI is big on just you’re protecting your income. That is the benefit. Long term care, it’s more about protecting your nest egg, for lack of a better word. You’ve worked all your life, and you have all this wealth accumulated. It can get sucked away so quickly paying for that stuff. So, you’re trying to be proactive about both yourself, and more specifically DI is about you, and then the people that count on you. LTC is more about the people around you are going to be either your caretakers, or the people that you have as legacy planning to have your wealth once you no longer need it. You’re buying LTC for the people around you. You’re buying DI for yourself, to then take care of the people around you. It’s more on you. Tim Mullooly: For both of those, there’s sort of a peace of mind element to it as well. Tim Mullooly: You’re mentally just knowing that, God forbid, something happens, you have that coverage to the point where you’re going to be okay. Dennis O’Connor: Like a lot of insurance with exception of maybe life insurance, because everybody dies, it’s one of those things that you buy it with hope that you never use it basically. Like you said, then you have the peace of mind, where if you do need it, you’re covered. You’re protected. You’ve planned for it. Tim Mullooly: Right. In terms of your family firm and to another level, just you as well, what’s one thing that you would like people to remember about working with you and working with your firm? Dennis O’Connor: To me personally, I like to say I consider myself the anti-insurance, insurance person. It’s very easy, especially having been in this my whole life, to get swept up and drink the Kool-Aid, and be like, you need this. And you do, but it’s very important to be aware of people and their situations and the fact that they don’t understand when I start ripping off facts about occupation riders and why this ones better than that one, because it’s got a better mental nervous exclusion. I think I do a very good job of keeping things simple, understandable, and hopefully never giving people the feeling that I’m trying to push something on them. My biggest thing is, because this is how I am, and this is how I’ve been even when I worked at surf shops, you sell yourself on something, and especially you look at our generation, the Google generation. My goal is to give you knowledge to make the decision yourself. No one’s going to know your life better than you. All I can hope to do is educate you enough on what I’m doing, so that you can take what I’m giving you to apply to yourself. Then, if you need my assistance, I’m here. Tim Mullooly: So, you’re there as a resource. Tim Mullooly: I think that’s good because like you said, some people hear the word insurance, and they get kind of turned off, because it can be for some people, a confusing topic or intimidating. I think that that’s a good thing to try and keep things simple. The simpler the better, I think, in my opinion. Dennis O’Connor: Yeah. Absolutely. It can work in your favor in some situations. If you’re at a party and someone is talking to you, and you don’t feel like talking. Oh, what do you do? You’re like, I sell insurance. They’re like, all right, see you. What’s that? Coming. You know, I have to go help in the kitchen. Tim Mullooly: Exactly. We’re going to transition now, kind of to the open ended concept questions that we like to ask all of our guests. First one as always being, how would you define being wealthy? Dennis O’Connor: A billion dollars in assets. Tim Mullooly: Okay, moving on. Dennis O’Connor: No. Having the ability to do whatever it is that makes you happy, essentially. That could be having a 300 foot mega yacht, but it could just be driving down the street and looking at birds or something. Whatever it is that provides you joy and allows you to live as relatively stress free as you can. That’s wealthy. Tim Mullooly: Kind of along the same lines, everyone works and earns money. What is earning money allow you to do outside of work that brings you fulfillment? I know you mentioned a couple times, working at surf shops and being a surfer. What are you passionate about outside of work? Dennis O’Connor: That’s really it. I do a bunch of stuff. We talked about it a little bit. I’m real big on music. I play guitar. I love that, but for me, it’s all about surfing. That’s just the thing I do I have the most fun with. I go as much as I can. I read about it, listen to it. I actually make my own boards. Dennis O’Connor: I’m just obsessed. That’s what this affords me the opportunity to do. Then now, having a family, it’s also getting to hang out with them, but I look forward to when he starts to play T-ball, or wants to surf himself, where working and then things like that will allow him and whatever other children I have, to enjoy themselves as well. Tim Mullooly: Would you say in retirement the goal is to spend as much time with your family surfing as possible? Dennis O’Connor: Oh yeah. I cannot wait until my son is five plus, so that I can … Hopefully he’ll enjoy it, but if not, he’s getting used as an excuse to go to the beach. If Finn wants to go surfing, we have to go. Sorry. Tim Mullooly: That’s awesome. Would you reconsider going back out to California for something like that? Having that consistent good weather out there. Tim Mullooly: Or are you content here in New Jersey? Dennis O’Connor: I like being here. It’s nice being around family, things like that. The people are definitely different. People here are much more direct, which can good and bad. If someone likes you, you’re tight. If someone doesn’t like you, they make you very aware of it, very quickly. But, I would be open to it, for sure. My wife’s in wine, that industry, so that’s a possibility for it still exists, yeah. Tim Mullooly: That’s a huge possibility for California. Dennis O’Connor: I would be open to it, especially kids, if they wanted to go do that. When I was out there, I used to run into kids all the time where we were in Escondido, which is North County, San Diego. They have surf period to start school. There’d be mornings where I’d be out there. I’d be pre-work, and they’d be out there. I’d be like, I just want you guys to know, I hate you so much, and I’m so jealous of the fact that this is school for you. This is your gym class. We got to play speedball. Tim Mullooly: Seriously, we played wall ball. Dennis O’Connor: Yeah, exactly. You guys are out here surfing for an hour a day. Tim Mullooly: So lucky. Let’s say that eventually someone invents a time machine. You can take that back in time, 10 maybe 15 years, and give yourself some advice, moving forward. What’s the one thing you would tell past Dennis? Dennis O’Connor: I saw this question, and I thought about it for a while. There’s nothing I’d really do to change where I’m at. I’m very happy with the progression of things in my life, but I would tell myself, for sure, enjoy your free time more. As marriage, children, job, as things have progressed, you start to realize just the absolutely ludicrous amount of free time you had, like in college. The things that could look at that, that now I look at it and I’m like, man, I used to just do nothing all day. I would kill to have five hours straight where I didn’t have to worry about work, take in a sauna, or do whatever it is. I’d be like, oh, cool. I’m just going to do whatever. Dennis O’Connor: Yeah. You’re watching some kind of stupid, some series on TV, marathon. It’s like the Walking Dead, seasons one through four. I’m just inside the whole time. Tim Mullooly: It’s like hey, this will all be on Netflix in 10 years. You can watch it later. Dennis O’Connor: Yeah, exactly. Listen, there’s going to be this thing called Netflix. You’ve lost me on this one. Go outside. Tim Mullooly: Yeah, that’s true. All right. That’s going to do it for this episode of Living With Money. Dennis, thanks for coming on. I really appreciate you taking the time to answer some questions for us. Dennis O’Connor: Absolutely. Thanks for having me. This was awesome. Tim Mullooly: Yeah. Hopefully, if you were listening out there, you got kind of smacked through the head, via the microphones here to start thinking about some disability insurance, and depending upon what phase you’re at in life, maybe some long term care as well. I will link in the show notes to NJLTC’s website, and so if you want to get in touch with Dennis you can. If you have a question that you’d like us to answer on, Living With Money, get in touch with us. You can email us at livingwithmoneypod@gmail.com. You can find us on Facebook and send us a message there, or you can tweet at us on Twitter. Shoot us a message on Instagram. We’d be happy to answer any of your questions. Thanks for listening to this episode, and we’ll see you on the next one.